Snapchat Rolls Out First Ad: It’s official – ads have come to Snapchat. The company announced via its blog that users would find an ad in “Recent Updates” over this past weekend. The ad would disappear after view or after 24 hours. Snapchat promises not to post ads within Snaps or Chats for the time being as it gauges how this initial ad rollout is taken by users. 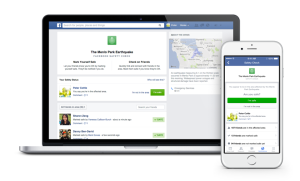 Facebook Launches Post-Disaster Communication Feature: On Wednesday, Facebook launched Safety Check, an app designed to help users communicate their status following disasters. The app is activated following a disaster if it determines you might be nearby based on the city you have listed on your profile, your location if you use the Nearby Friends feature, or the city where you are using the internet. You will then be prompted to either check “I’m safe” or if you’re outside the disaster area. Your status will then appear on your news feed, alerting those in your network. YouTube’s Creator Academy Now Available in 2 Languages: YouTube’s Creator Academy, which provides free online digital storytelling lessons to YouTube users, is now accessible to wider audiences. YouTube has made Creator Academy more accessible by making lessons available in 20 different languages. The full list of languages can be found on YouTube’s Creators blog.